Two incidents that involved me with seagulls were the inspiration for this poem. One was the inexplicable sight of a seagull hanging in a polythene carrier bag noose from a forty foot high lamp standard. The other was a sort of epiphany of my own death that I had for the few seconds as a seagull hovered directly in front of me while attempting to grab some of my ham salad roll in Penzance. At the time of writing this poem, seagulls were getting bad press from the tabloid newspapers for a series of incidents around the country. Prime Minister David Cameron got involved in the debate suggesting that “it is time for a big conversation about them”. These newspapers, essentially the tabloids, make use of emotive language to describe what was really the natural behaviour of seagulls; a behaviour that has been influenced by the ease in which we, as a society dispose of our rubbish. Some time ago, I studied how newspaper journalism used the tone and register of its language to influence the way its readers receive information. As a postman for over ten years in the affluent constituency of Sheffield Hallam (perhaps you’ve heard of it? ), I could say I also I did an intensive door-to door survey of the headlines of particularly The Daily Mail and The Daily Express on the doormats of well-to-do Sheffielders. What I was hoping to bring to people’s attention was how people who are usually quite caring in their lives can be so easily influenced into thinking deeply negative thoughts by their choice of newspaper. The similarity of the language used in the recent reporting of the Syrian refugee crisis to that used against seagulls in these papers was, in my opinion, disturbing. …is quite unfair, but like the newspapers I am lampooning, I’m not letting the truth get in the way of a good story. I also have a sneaking suspicion that Ms Hedren still secretly hates seagulls. A seagull hangs from a lamp standard. How it got there is hard to deduce. Just what balance of circumstance left it twirling in a polythene noose? Which leaves us with only one answer – it’s a Damien Hirst exhibit. As I tucked into a ham roll on The Terrace, Market Jew Street, Penzance. As sun-dappled feathers embraced me…was this the so-called ‘tunnel of light’? Fluttering wings…an angel perhaps, pulled at my hands with religious zeal. Told me – you must cover up your croust when eating al fresco in Cornwall. Some say the problem’s quite out of hand; in fact it’s decidedly nasty. In St Ives you take out insurance when buying a medium steak pasty. Once the dust (and ham roll) had settled, I attached to that seagull no blame. In seeking to provide for her child; wouldn’t we all of us do the same? Then I pick up my morning paper – a tabloid that works by detrition. The ‘hard-working tax-payers’ bible, made whole by its sins of omission. “Diabetes is out of control” and there’s a Canderel shortage too. First Rumanians, Bulgarians…now giant hornets are ‘swarming’ here. Day after day of these headlines that are served up to instil me with fear. They’re making me scared of ev’rything except myself and William Hague. It comes with me into the bathroom and I read it while sat on the loo. I’m a martyr to constipation…for a while stuck on page number two. Later I stare through the window at a lone seagull chick hunched in the rain. Her hard-working mother is tireless as she feeds her again and again. Full employment and with not much done my house is worth a small fortune. National care ‘from cradle to grave’. My homeland has not had to face war. All in all I’ve had quite a good life; then I pick up my paper once more. And sneer as the ‘beautiful people’ parade in what passes for fashion. So many problems despite their wealth. I’ve already lost all compassion. Told of the scams of the ‘so-called’ poor. More fiddling than Stephane Grapelli. Arrogant, wryly, living the life. I’ve seen some of them on the telly. That seagull chick is looking distressed. Imagine if mum never returns. I’ll surely ring the RSPB and notify them of my concerns. Seagull and I together broke bread in an act of social communion. Whether seagulls’ ASBO behaviour makes them worthy of preservation. Our prime minister has suggested that it is time to take these birds out. 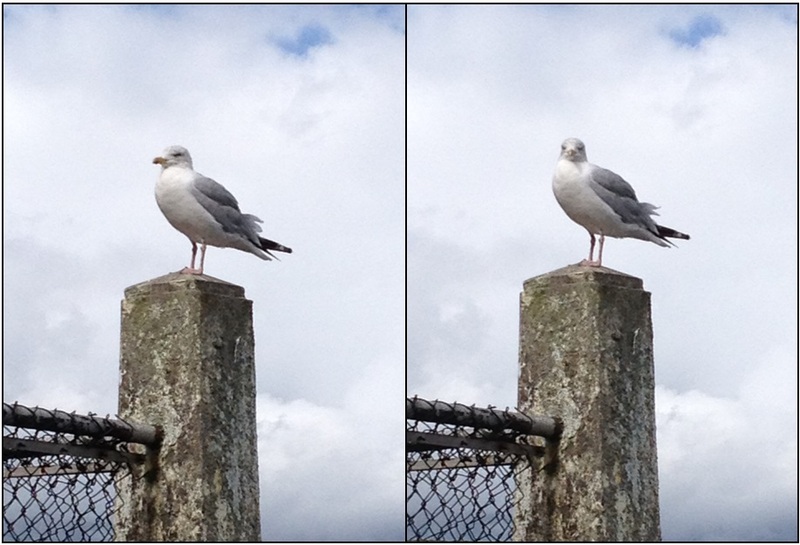 A gull once stole ham from his sandwich. (oh the irony!) It left the pesto dressing no doubt. It seems they’ve formed themselves into gangs just like a scene from Hitchcock’s The Birds. The article overpowered me… I succumbed to a blitzkrieg of words. Marauders’, ‘menace’, ‘rats of the sky’. So the language began to take hold. ‘Evil’, ‘destructive’, ‘malignant’…’foul’…as overwrought adjectives unfold. And Tippi Hedren gives helpful tips – one of which involves a bazooka! Although it seems the line was drawn at skilled marksmen brought in from The Balkans. I glared at the gull out the window as she spewed the food into her chick. Been down into town for her handouts; her ‘something for nothing’ makes me sick. Coming here taking our pigeons’ jobs and now just scrounging on our welfare. These gulls can live up to forty years…they’re so fit they’ll outlive our obese. Will it extend to other bird types? Imagine being harassed by geese. A pox on these damnable seagulls, lame ducks, sick parrots and ill eagles. Hang ‘em high from every lamp-post…if only to focus their fouling. Calmed myself for the tenth time today…Maybe it’s time I changed my paper? Hi. Never mind the geese we now have swans that turn up regularly to be fed with the seagulls at 11o’clock and the little terns are back for the winter. Such a mixed community.